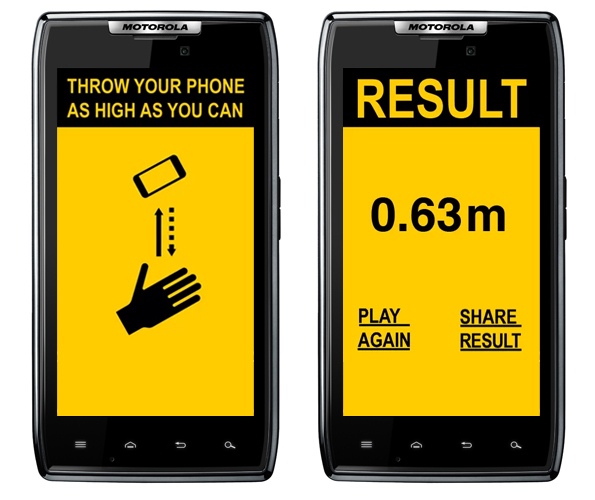 Brilliant Idea: Smartphone "Game" Challenges You To Throw Your Phone As High As Possible | OhGizmo! Would You Let This Robot Stab You In The Arm? By David Ponce on 08/06/13 • Leave a comment! Oh, what could possibly go wrong? SMTH (Send Me To Heaven) is a simple application that uses a phone’s accelerometer to determine just how high above the ground the device has reached, after it’s been foolishly thrown up in the air by some overconfident simpleton. The higher the better, with high scores posted online in a bid to challenge you to outdo your similarly quick witted friends. It’s only available for Android phones, probably because Apple took some issue with the idea in general. But hey, if your phone is on the way out in the first place, maybe this is a cool way to send it off. Kind of like doing a smoke show in the parking lot when it’s time to replace your car’s tires?